The Forest Leaf Collection takes its inspiration from the intricacies of form and texture found in foliage from around the world. I believe everybody has an emotional response when they see natural objects. They are part of all of us. I imagine eating with implements given to me by the forest itself. It’s primordial yet evocative of something timeless. For me, these pieces have elegance but remain a touchstone to the natural world. 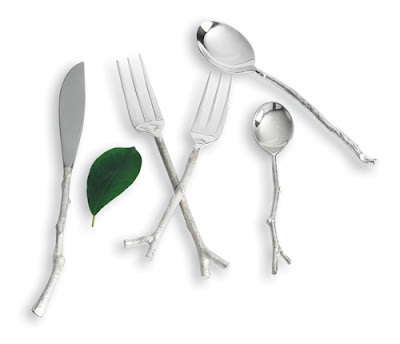 Natural twigs cast in place with stamped tops, in silver plate – add a piece of the forest to your place setting! !